I am yet to find a better place than Green Waffle Diner for waffles in Hong Kong! Inconspicuously located on Graham Street, Green Waffle Diner is a cosy American-style diner which serves comfort food from chicken wings and steak sandwiches to pancakes and waffles. It is best known for their pandan waffles, and they have an amazing recipe which ensures that the waffles are incredibly light and fluffy! Food is not expensive to start with, and during the week, they have great-value set lunch for $83 which includes a hearty main course, half a waffle and coffee/tea. Note, though, that bookings for lunch can only be made for 12.15pm or 1.15pm – rather inconvenient for most people, but that just shows how popular this eatery is! I personally prefer to come here in the weekend for a chilled afternoon tea, when this small restaurant is less crowded. 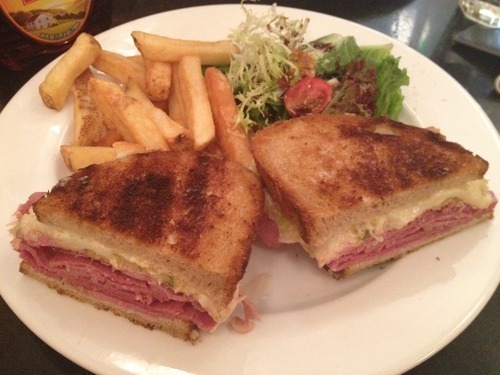 (1) The Reuben ($101) is Green Waffle Diner’s signature dish, and it is a grilled sandwich served on slices of rye bread, pilled high with sliced corned beef and sauerkraut, melted Swiss cheese, and the secret Reuben sauce. The rye bread was nicely grilled, the steak was generous in portion and not too salty and the melted cheese was really stringy and addictive. The “secret Reuben sauce” actually tasted like thousand island dressing, and I absolutely loved this sandwich! 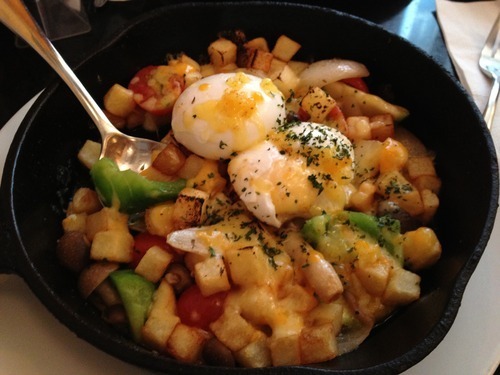 (2) The herbed veggie skillet was a main course for the set lunch. The poached egg was beautiful, and the crunchy potato cubes and vegetables just came together marvellously! My friend A liked dipping the potatoes in ketchup for extra flavours, but I found the skillet very hearty and flavourful as it was. 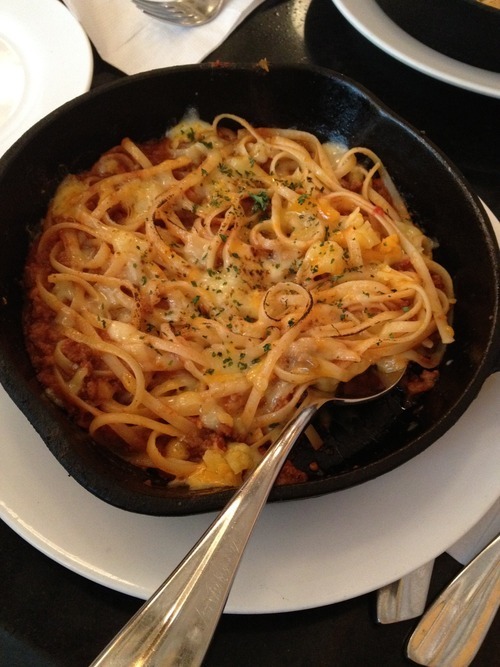 (3) The Big Spaghetti Bolognese was also a main course that came with the set lunch. I was surprised to find the pasta al dente (I didn’t expect American eateries to master this art)! The Bolognese sauce was tangy and satisfying, and was delicious with lots of cheese. This dish was rather heavy, but the waffles were very light so I was not overwhelmed after the meal! (4) You could order the buffalo wings in 3 or 6 pieces ($28/ $56). 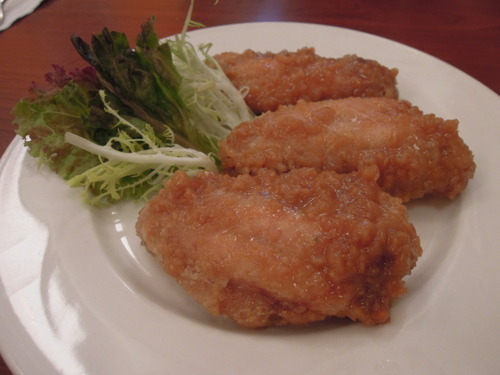 These little wings were crispy, scrumptious and totally addictive! (5) Our first waffle was the Berry Waffle Delight ($57), which was a waffle topped with blueberries, bananas and strawberries, finished with whipped cream and a light drizzle of chocolate. The waffles at Green Waffle Diner are much more fluffy than Belgian waffles, which tend have a more substantial texture and is more buttery. I was completely drawn to these fluffy waffles, which were so light and pillowy that you wouldn’t stuffed even after eating the whole thing! Moreover, it really reminded me of those divine madeleines I had at Liberty Private Works (Hong Kong)! (5) This Pandan Waffle ($57) was infused with Pandan Cheffron juice, and was in a mild light green colour. You could order the pandan waffle on its own for $28, and then add fruits, toppings and ice creams, instead of getting this fixed combination. 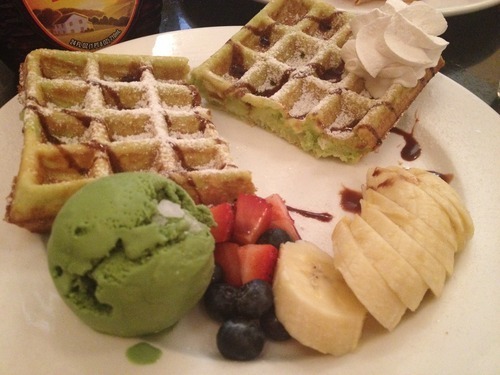 The Pandan Waffle and the accompanying fresh, juicy fruits and green tea ice cream were a match made in heaven! My only complaint was that the green tea ice cream was a bit icy, but that side, this dessert blew my mind! 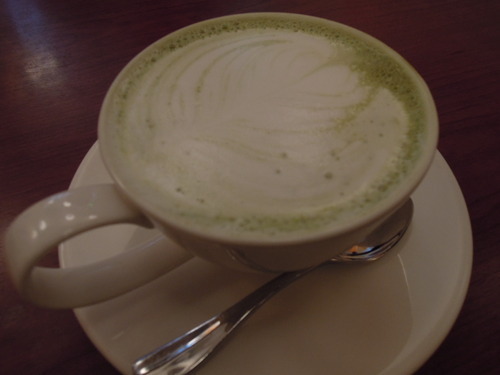 (6) My friends all know that I have developed a chronic addiction to anything green tea-flavoured since my visit to Urth Caffe in Los Angeles in May. I have had to resort to Starbucks Green Tea Latte to satisfy my cravings, but here at Green Waffle Diner, I found my fix! Unlike Starbuck’s pathetic attempt, this terrific cup before me had a strong matcha flavour and aroma, and was most importantly not bitter. It was perhaps not as thick and creamy as the one at Urth Caffe (which was the best I have ever had, so far), but I had no complaints and happily downed the entire cup. Conclusion: I was getting hungry just from writing this review. 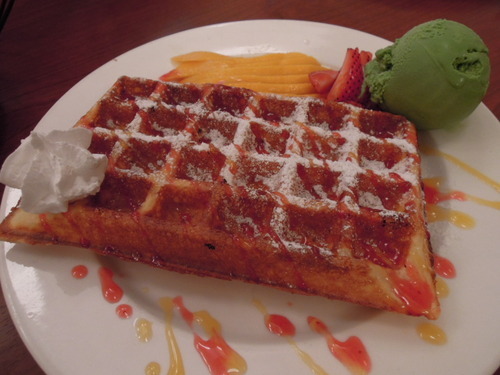 I cannot wait to devour another Pandan Waffle with strawberries and ice cream! Entrepreneur, blogger, and freelance writer. Food, beauty, lifestyle, and travel. Made in Australia, educated in the UK, currently living in Hong Kong.